The person who made this glyph perhaps 1000 years ago user imagination in the pursuit of beauty and meaning. And only recently has it been vandalized. The desert is full of all kinds of treasures, gold, silver, and other rare elements. Even water in the desert can be considered a treasure and the source of immense wealth. One of the greatest treasures that we have in the desert is art, and we can truly call this art a treasure. And like all treasures, it needs to be protected and watched over because there are people who will steal and vandalize it. And of course I'm talking about the petroglyphs and pictographs that dot the desert landscape. And while this art form has been around for a long time, it is only now beginning to be appreciated for what it really is. But there's the one replaceable element that all art must have, and that is beauty and style. And here one might be tempted to downgrade or minimize the beauty and style that these petroglyphs and pictographs have. However, I would say to look again and you might see the skilled hand of an artist. All you have to do is look at the low quality of the modern graffiti that has defaced and insulted them in modern times to see that these ancient artists were skilled indeed. And then we should also appreciate that they incorporated the style and symbolism that was part of their culture and language that we know little of except through this art. But what we do know is that the life of a hunter-gatherer is often difficult and dangerous. It is a life filled with hunger and exposure to the extremes of weather that we living in this day and age really don't know. And so for a person living under these conditions to take upon themselves to produce art, to make something beautiful that would speak to generations yet to come is truly remarkable. If this is not enough for us to treasure them, to protect them, and pass along to all the generations yet to come, one can only ask what does this say about our present society? He who despises himself nevertheless esteems himself as a self despiser. The Coso Mountain petroglyphs are the last remnant of a society that started thousands of years ago and lived almost to our present time. 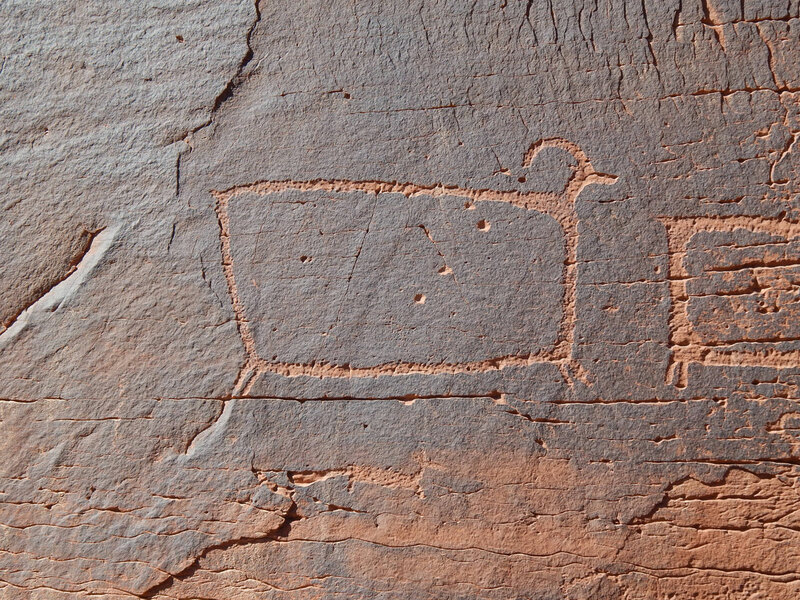 And through the artistry and symbolism of these petroglyphs we know that it was a hunter gather society that was based on hunting desert bighorn sheep. Not all petroglyphs lend themselves to be interpreted or understood. Those that do can give us tremendous insight to the ways of the past. In this picture we have three different petroglyphs from a panel in the east Mojave preserve. Each had meaning and value at the time that were created. A discussion about the various structural attributes of a mountain that can lead one to find water. This book is often referred to as “Welles and Welles” in normal conversation as well as in scientific literature.